I was deep in the midst of a hectic day at work when the phone in my pocket announced the arrival of a new picture message… Sneaking a quick peek, I glimpsed an image that was instantly familiar, but definitely out of place. 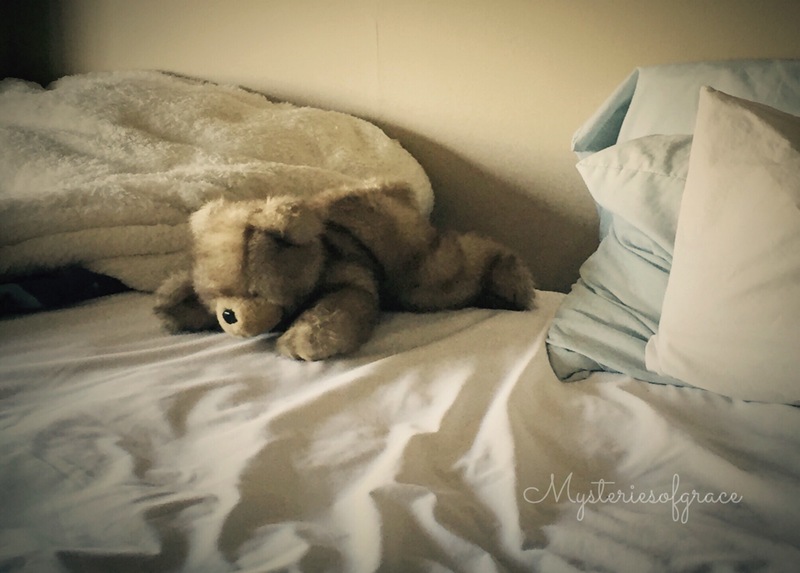 There in the midst of wrinkled sheets and crumpled pillows lay a warmly familiar fuzzy bear. Face down, paws outstretched, in comfort or in reverence, I don’t know. Relaxed. At home. Comfortable. A thousand images of dimpled cheeks, chubby fingers, and cozy bear hugs flashed through my mind and heart. It was my son’s bear. Was. Years ago. He had long left behind his fuzzy friend for the world of video games, high school, and cars. He no longer needed the presence, friendship, or comfort of Little Bear. Bittersweet, it took me a moment to fully recognize the importance of the candid photo my daughter had just snapped. Little Bear left us several months ago. 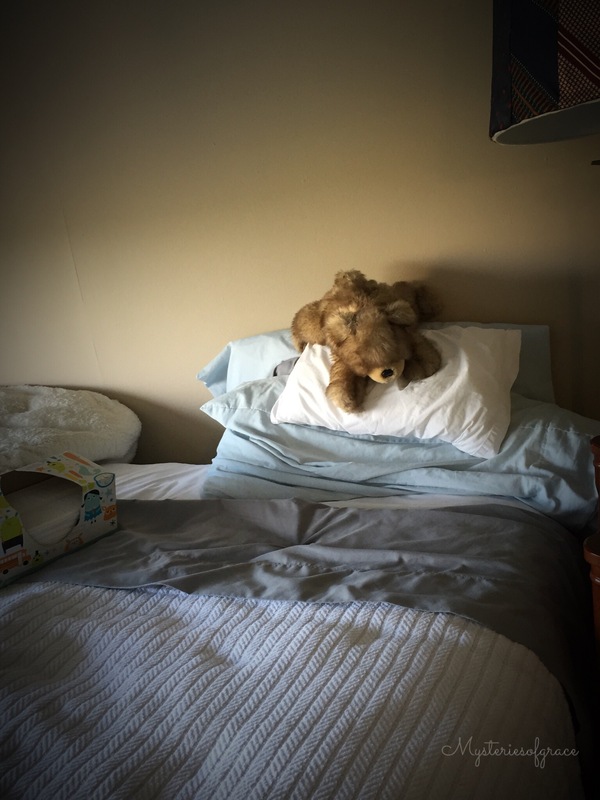 My daughter works at an assisted living facility and had recently devised a creative, thoughtful idea: outgrown childhood stuffed animals may find new purpose in the faithful, tired arms of her elderly residents. It had been less traumatic for me to release Little Bear knowing that he would find a new home, a fresh start, and a renewed purpose. This was my first glimpse into his new life. The following day I received a second Little Bear photo with the caption: “He got the place of honor today.” There he lay atop the pillow of a worn soul, young yet old, offering comfort and companionship, love and acceptance. I doubt Little Bear is really aware that he is loved and wanted and fulfilling his purpose… Walking out his calling as a companion and a comfort. He wasn’t knit together with a heart and soul longing for acceptance and communion. A place to belong and a purpose to fulfill. A calling. A knowing of who he is, why he is here, and how he can make a difference. A need to love and be loved. To comfort and be comforted. Is everyone created with a need to feel that they belong and are loved? That they have a purpose? An inner knowing that they can make a difference? I started a new bible study this week. The promise and encouragement for today: Philippians 1:6 says “…He who began a good work in you will carry it on to completion until the day of Christ Jesus.” Okay, so maybe the verse doesn’t exactly reference teddy bears or life goals and purpose but it does point back to a past, a beginning, as well as project forward to a process, and finally to an end. A completion. 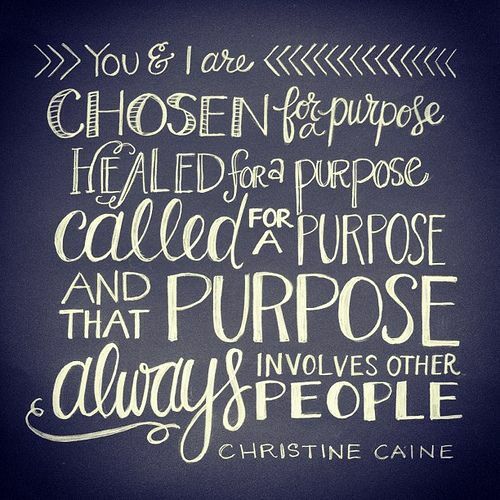 A purpose. It’s a promise. It doesn’t guarantee an easy journey and doesn’t say we won’t be repurposed along the way. But it says He knows, He plans, He gives, He completes. When there is confusion, loss, or lack of direction along the way, there is promise of presence, purpose and completion. And for that I am thankful.